With ngRoute module to make a parameter optional we include a question mark (?) at the end of the parameter name. With ui-router the parameters are optional by default, so there is nothing special that we have to do. Let us understand ui-router optional parameters with an example. Here is what we want to do. On the list of students page, we want to search employees by name. For example if we type "Ma" and click search button, on the subsequent page we want to display all the student names that start with "Ma". 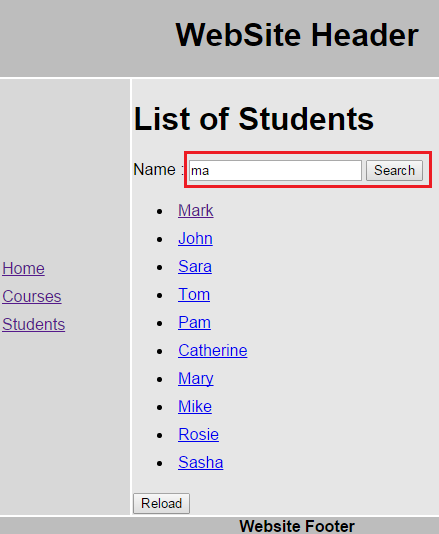 On the other hand, if we do not enter any name in the search text box and click search button, on the subsequent page we want to display all the student names. In this case the name parameter value should not be passed in the URL. The URL should be as shown below. So in summary, the name parameter should be optional. Here are the steps. Step 1 : Define studentsSearch state. Notice in the url property we have included name parameter. Notice, we have not done anything special to make it optional. By default UI router parameters are optional. Step 2 : The studentSearch() function that gets called when the search button is clicked is in studentsController function. Notice we are using $state service go() method to activate studentsSearch state. We are also passing a value for the name parameter. If there is something typed in the search text box, the value is passed in the URL to the state, otherwise nothing is passed. So name URL parameter is effectively optional. Step 3 : Modify studentsSearchController function to retrieve name URL parameter value. Notice we are using $stateParams service to retrieve name URL parameter value. Excellent AngularJs 1.5 tutorial. Many Thanks for keeping this valuable resources for free.